Not to be confused with AT&T Park in San Francisco; AT&T Center in San Antonio; AT&T Field in Chattanooga, TN; Jones AT&T Stadium in Lubbock, TX; or AT&T Field at War Memorial Stadium in Little Rock, AR. Campbell & Associates Consulting Engineers, Inc.
AT&T Stadium, formerly Cowboys Stadium, is a city-owned 80,000-seat capacity stadium with a retractable roof in Arlington, Texas, United States. It serves as the home of the Dallas Cowboys of the National Football League (NFL). It replaced the partially covered Texas Stadium, which opened in 1971 and served as the Cowboys' home through the 2008 season. It was completed on May 27, 2009. The facility can also be used for a variety of other activities outside of its main purpose (professional football), such as concerts, basketball games, college and high school football contests, soccer matches, and motocross and Spartan races. The stadium is sometimes referred to as "Jerry World" after Dallas Cowboys owner Jerry Jones, who originally envisioned it as a large entertainment mecca. The stadium seats 80,000, making it the fifth largest stadium in the NFL by seating capacity. The maximum capacity of the stadium with standing room is 105,000. The record attendance for an NFL game was set in 2009 with a crowd of 105,121. The Party Pass (open areas) sections are behind seats in each end zone and on a series of six elevated platforms connected by stairways. It also has the world's 24th largest high definition video screen, which hangs from 20-yard line to 20-yard line. Originally estimated to cost $650 million, the stadium's current construction cost was $1.15 billion, making it one of the most expensive sports venues ever built. To aid Cowboys owner and general manager Jerry Jones in paying the construction costs of the new stadium, Arlington voters approved the increase of the city's sales tax by 0.5%, the hotel occupancy tax by 2%, and car rental tax by 5%. The City of Arlington provided over $325 million (including interest) in bonds as funding, and Jones covered any cost overruns. Also, the NFL provided the Cowboys with an additional $150 million loan, following its policy for facilitating financing for the construction of new stadiums. A pair of nearly 300 ft (91 m)-tall arches spans the length of the stadium dome, anchored to the ground at each end. The new stadium also includes "more than 3,000 Sony LCD displays throughout the luxury suites, concourses, concession areas and more, offering fans viewing options that extend beyond the action on the field". It also houses a center-hung Mitsubishi video display board that was the largest high-definition television screen in the world at the time of their installation. It has since been surpassed in size by the Panasonic "Big Hoss" video board (218 feet (66 m) wide and 94.6 feet (28.8 m) tall) at Texas Motor Speedway. Glass doors, allowing each end zone to be opened, were designed and constructed by Dallas-based Haley-Greer glass systems. The retractable roof was designed by structural engineering firm Walter P Moore and the systems were implemented by mechanization consultants Uni-Systems. The electrification of Cowboys Stadium's retractable roof was developed by VAHLE, Inc. These Kinetic Architecture fundamentals will be employed in order to create quick conversions of the facility to accommodate a variety of events. When the design was officially unveiled on December 12, 2006, it showed that, from inside the stadium, the roof (membrane installed by K Post Company of Dallas) will look very similar to the Texas Stadium roof, with its trademark hole. However, it can be covered by the retractable roof panel to protect against the elements. A Dallas Cowboys Hall of Fame is planned for the Hall of Fame level. The drawings also include a site for a large sculpture northeast of the stadium, close to Randol Mill Road. Mayor Robert Cluck claimed to use eminent domain as a last resort but most of the properties refused to sell to the city, indicating that the incentive program was not adequate according to Glenn Sodd, an attorney representing some home owners in the area. Attorney Bob Cohen, who is representing some of the property owners, said the city gave many of his clients little incentive to sell. He said he represents the owners of some rental properties who were counting on that monthly revenue for their retirement and said most homeowners cannot afford to re-build or buy in that area with the incentive package. It is claimed that the stadium uses more electricity than the whole of Liberia. 1994: Cowboys owner Jerry Jones says he wants to expand the 65,000-seat Texas Stadium by up to 40,000 seats, add retractable roof panels and install a climate-control system to make the stadium a year-round venue for sporting events, including the Super Bowl, concerts, and conventions. 1997–2000: The Cowboys hold preliminary talks with Arlington officials about building a stadium there. The team also publicly discusses a $260 million plan to upgrade Texas Stadium. In 2000, the Cowboys compile a list of potential stadium sites, which include Grapevine, Coppell, and Arlington. The team continues negotiating with Irving to renovate Texas Stadium. 2001: Jones says Arlington is a leading contender for a $500 million stadium. The primary site considered is the 2,000 acres (810 ha) Lakes of Arlington tract on Farm Road 157. Other cities in the running include Grapevine and Grand Prairie. In October, Jones discusses the new stadium with the mayors of Arlington, Irving, Grapevine, and Dallas. 2003: The Cowboys ask the Irving City Council to extend their lease at Texas Stadium, which expires at the end of the 2008 season, on a year-to-year basis. They narrow their search to sites in Las Colinas and Dallas, and state legislators file bills that would allow Dallas County to increase its hotel occupancy and car rental taxes to pay for a new stadium. 2004: In April, the Cowboys announce plans to build a $650 million stadium at Fair Park in Dallas. The deal requires $425 million in public financing from a 3% hotel-occupancy tax and a 6% car-rental tax. The deal falls apart in June when Dallas County commissioners say they cannot justify asking voters to approve the team's request for $425 million in public funding. In July, the Cowboys and Arlington announce they are negotiating to locate the stadium near Globe Life Park (then Ameriquest Field). In August, the Arlington City Council agrees unanimously to put before voters a tax increase that would fund the city's $325 million portion of the project. Voters approve the tax increase on November 2. 2005: Arlington and the Cowboys choose the site south of Randol Mill Road and east of Collins Street for the new stadium. The city begins notifying residents and property owners of its plans to acquire their property. The Cowboys hire the HKS architectural firm to design the stadium. Early blueprints show 414 luxury suites and a two-panel retractable roof. The city completes its sale of $297.9 million in bonds to pay for its portion of the construction. Demolition of houses begins November 1. January 2006: The Cowboys hired Oklahoma-based Manhattan Construction as the general contractor for the stadium and the city completes its land purchases, although it still faces a number of lawsuits over land acquisition. Later that month, Tarrant County work crews begin demolition of more than 150 Arlington residences and small business structures to make room for the stadium. March 2006: Alliance announced between Manhattan Construction and two general contractors, Rayco Construction of Grand Prairie and 3i Construction of Dallas, to manage the stadium's construction. April 2006: Excavation begins by Mario Sinacola and Sons Excavating. By August, they had moved over 1.4 million cubic yards of earth, shaping a 13-to-14-acre (5.3 to 5.7 ha) stadium bowl an average of 54 feet (16 m) deep. August 2006: Two construction cranes are raised on the site. October 2006: The grass amphitheater on Randol Mill Road is leveled to make way for the extension of Baird Farm Road. December 2006: The stadium's structure begins to go up and on December 12, Jerry Jones unveils the in-depth plans and designs of the stadium to the public. January 2007: A construction worker is injured in a 20 ft (6 m) fall. February 2007: Masonry work begins. March 2007: Heldenfels Enterprises awarded the contract to manufacture and erect the pre-cast/pre-stressed concrete structural components and placement of them begins in April. June 2007: Work on the retractable roof, designed by Uni-Systems, starts. July 2007: Exterior facade and enclosure work began. October 2007: First steel arch is completed. February 2008: Second steel arch is completed. June 2008: Jones commissions the world's largest 1080p HDTV, to hang above field. June 2008: An electrician is electrocuted while working on the stadium. Two days before, three people were injured while assembling a crane. 2009: The stadium is scheduled for 'substantial completion' in June. The artificial-turf field was brought into the stadium in July. The Cowboys played their first pre-season home game on August 21 and their first regular-season home game on Sunday, September 20. May 13, 2009: Jerry Jones announced the official name of the new venue as Cowboys Stadium. February 6, 2011: The 2010 NFL Season Super Bowl was hosted at the Cowboys Stadium, which saw the Green Bay Packers defeat the Pittsburgh Steelers in Super Bowl XLV. July 25, 2013: Jerry Jones announced that the official name of the venue was changed to AT&T Stadium as part of a naming rights deal. April 5–7, 2014: The stadium is home for the Final Four of the 2014 NCAA Men's Division I Basketball Tournament. January 12, 2015: Served as host of the first Championship game in the College Football Playoff era. Ohio State defeated Oregon, 42-20. April 3, 2016: Served as the host of WWE Wrestlemania 32. May 27, 2009: Completed and opened to the public. Ribbon cutting ceremony includes Cowboys players (including Rayfield Wright, Troy Aikman, Emmitt Smith, Michael Irvin, Daryl Johnston, Preston Pearson, and Chad Hennings), North Texas mayors and various media personalities. June 6, 2009: Country music star George Strait along with Reba McEntire headlined the first event in the new stadium. Opening acts included Blake Shelton and Lee Ann Womack. July 19, 2009: The first sporting event is held in Cowboys Stadium. Costa Rica won in the Gold Cup Quarterfinal game versus Guadeloupe, with the first goal scored in stadium history during the 2nd minute by Celso Borges. That match was immediately followed by a sold out match between Mexico and Haiti, with 82,252 in attendance. July 26, 2009: The final match of the 2009 World Football Challenge is held between Chelsea F.C. and Club America. The London club won the match 2-0 in front of 57,229. The event was the second sporting event held in the new stadium, but was notable as the first event held during a severe thunderstorm. August 20, 2009: Jody Dean, a member of the Texas Radio Hall of Fame and KLUV-FM (98.7) talk show host, will be Cowboys Stadium's public address announcer. Dean replaces KTCK 1310 AM "The Ticket"'s George Dunham, the longtime voice of Texas Stadium. August 21, 2009: The Cowboys played the Tennessee Titans in their first preseason home game and first American football game ever played at Cowboys Stadium. The game was nationally televised on FOX at 7 PM CDT. Dallas won the game 30–10, with one play from scrimmage blown dead when a ball punted by Titans' rookie punter A. J. Trapasso struck the main video screen after repeatedly striking it during pregame warmups. September 20, 2009: The Cowboys played their first NFL regular season game in the new stadium, with former President and Texas resident George W. Bush handling the opening coin toss. The Cowboys lost to their long-time NFC East division rivals, the New York Giants, 33–31 with Eli Manning leading them on a last second field goal by Lawrence Tynes. It was televised on NBC. This game attracted a record-breaking crowd of 105,121. After the game, Manning signed the wall of the visitor's locker room with the message, "First win in the New Stadium." September 28, 2009: The Cowboys got their first home regular season win. They beat the Carolina Panthers 21–7 with 90,588 in attendance. The game was televised on ESPN's Monday Night Football and marked a record 42nd win for the Cowboys on MNF. Although the stadium had yet to sell naming rights, many fans started referring to the project with various nicknames such as JerryWorld, the "Death Star", "The Palace in Dallas" (for which announcer Bob Costas was criticized by the Arlington mayor), "Cowboys Cathedral", "Jerrassic Park" and others. There was also a petition by some fans to have the stadium named after longtime Cowboys' coach Tom Landry. On May 13, 2009, Jerry Jones announced the official name as Cowboys Stadium. On July 25, 2013, Jerry Jones announced that the Dallas Cowboys had agreed to grant naming rights to AT&T. The name change from Cowboys Stadium to AT&T Stadium took effect immediately. The sponsorship deal was reported to be worth about $17–19 million per year. Facility Solutions Group installed the "AT&T Stadium" letters on the top of the stadium. Signage includes two sets of letters 43 feet (13 m) tall stretching 385 feet (117 m). The letters are made of lightweight components and aluminum and are insulated and heated to melt ice and snow. This is AT&T's fourth major sports venue where it holds the naming rights. The others are AT&T Park in San Francisco, AT&T Center in San Antonio, and Jones AT&T Stadium in Lubbock. Guinness World Records was on hand at the September 28, 2009 game against the Carolina Panthers to award certificates to the Chairman of Mitsubishi Electric and Dallas Cowboys owner Jerry Jones for the World's Largest High-Definition Video Display. For basketball events played in Cowboys Stadium, such as the 2010 NBA All-Star Game, the video board is actually larger than the court. It has since been surpassed in size by the video boards at Everbank Field. During the debut preseason game of Cowboys Stadium on August 21, 2009, a punt by Tennessee Titans punter A. J. Trapasso hit the 175 feet 0 inches (53.34 m)-wide screen above the field. The punt deflected backwards and was ruled in-play until Titans coach Jeff Fisher informed the officials that the punt struck the scoreboard. By rule, the down was replayed. Jerry Jones believes that Trapasso was trying to hit the scoreboard, saying, "If you look at how you punt the football, unless you're trying to hit the scoreboard, you punt the ball to get downfield. You certainly want to get some hangtime, but you punt the ball to get downfield, and you sure don't punt the ball down the middle. You punt it off to the side." Whether the screen would affect an opposing team's punting strategy has been debated. For teams with strategies centered on maximizing hang-time, physicist Christopher Moore of Longwood University has shown via computer simulation that well-kicked punts have the potential to hit the screen no matter the field position. Trapasso disputed Jones' suggestion that he was intentionally trying to hit the board, and other NFL punters have suggested that the board may pose a problem for longer hang-time punts. The screen was retrofitted with 16 custom winches using 11,000 feet 0 inches (3.35280 km) of 1.5 inches (3.8 cm) domestic galvanized wire rope from Tway Lifting Products to accomplish the safe, efficient transport of the video board in time to make room for U2's massive set during their 360° Tour, and was moved back down after the concert. The video board is also the primary attachment point for up to 370,000 pounds 0 ounces (167,829.2 kg) of concert and theatrical rigging. On August 24, 2013, Cowboys punter Chris Jones became the second player to hit the scoreboard. He conceded a touchdown on the re-kick. On February 14, 2010, the stadium hosted the 2010 NBA All-Star Game. With an announced crowd of 108,713, the game became the highest-attended basketball game in history, setting a new Guinness World Record. The East squad prevailed with a 141–139 victory over the West. On January 3, 2010, the Cowboys defeated the Philadelphia Eagles in a 24–0 shutout to win the NFC East division title and complete the first ever back-to-back shutouts in franchise history. On January 9, 2010, the Cowboys hosted their first playoff game in the new stadium, again playing the Eagles. Dallas won 34–14, breaking their infamous 13-year playoff win drought. On February 6, 2011, the stadium hosted Super Bowl XLV in which the Green Bay Packers defeated the Pittsburgh Steelers, 31–25. Others bidding for the game's location were the University of Phoenix Stadium in Glendale, Arizona and Lucas Oil Stadium in Indianapolis, Indiana. The Cowboys attempted to increase its capacity to 105,000 seats in hopes of setting the record for attendance at a Super Bowl. In a last-minute rush to add seats during one of the area's notorious ice storms, 7 construction workers were injured by ice sliding off of the stadium roof. Hours before kickoff, over 1,200 seats were blocked off in the interest of safety; according to a police officer in the affected area, the seats hadn't been finished in time for the fire marshal to inspect them. Approximately 800 people were given other seats inside the stadium, thus costing the NFL any chance of setting the Super Bowl attendance record (the final figure of 103,219 came 766 short of the record set in Super Bowl XIV). However, about 400 people were unable to be seated and were given a letter from the NFL that could be exchanged for three times the face value of the ticket. Those people were also given the option to either watch on a TV in one of the stadium's lounges, where they would be unable to see the field in person, or watch on screens outside the stadium. The NFL also announced that those 400 people would receive free tickets to the next year's Super Bowl. On February 9, 2011, the first lawsuit was filed against the NFL and Jerry Jones. January 12, 2015: The (4) Ohio State Buckeyes defeated the (2) Oregon Ducks 42–20, before a crowd of 85,689 in the inaugural 2015 College Football Playoff National Championship. AT&T Stadium, then known as Cowboys Stadium, was the site of the 2009 and 2010 Big 12 Championship Games, the last two held prior to the 2010–13 Big 12 Conference realignment. 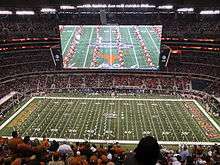 On December 5, 2009, the Texas Longhorns defeated the Nebraska Cornhuskers 13–12 in the 2009 Big 12 Championship Game, the first to be held in the stadium with attendance announced at 76,211. The following year, on December 4, 2010, the Oklahoma Sooners and Nebraska Cornhuskers rekindled their rivalry as the Sooners won 23–20 in the final Big 12 Championship game to date. The stadium was scheduled to host the games through the 2013 season, but the realignment of the Big 12 Conference to 10 teams meant they were not allowed to host a championship game because of NCAA rules requiring conferences to have at least 12 teams divided into two divisions in order to stage a championship game. January 2, 2010: In the first bowl game played at the stadium, the Ole Miss Rebels defeated the Oklahoma State Cowboys, 21–7 in the 74th installment of the AT&T Cotton Bowl Classic. Attendance was 77,928 and was the third largest attendance of any preceding Cotton Bowl game. With Oklahoma State having played in the Cotton Bowl, all Big 12 South Teams have played at least one game in the Cowboys Stadium. January 7, 2011: In the 75th installment of the AT&T Cotton Bowl Classic, the LSU Tigers by a score of 41–24 defeated the Texas A&M Aggies with an outstanding attendance of 83,514 making it the second largest attendance in Cotton Bowl history. LSU finished with an 11–2 record and Texas A&M finished 9–4 making it their 49th meeting all time. January 6, 2012: The Arkansas Razorbacks defeated Kansas State Wildcats, 29–16. Attendance was 80,956, currently the third-highest attendance in Cotton Bowl history. During the game, Arkansas receiver Joe Adams returned a punt 51 yards for a touchdown, which was the first punt return for a touchdown in the Cotton Bowl since former Arkansas Razorback Lance Alworth returned a punt 49 yards for a touchdown in a 7-6 loss to Duke in 1961. The win also propelled the Razorbacks to a #5 ranking in the final AP poll and gave them their first 11-win season since joining the Southeastern Conference in 1991. Kansas State ended the season with a 10-3 record and ranked #15 in the final AP poll. January 4, 2013: The (10) Texas A&M Aggies defeated the (12) Oklahoma Sooners 41–13 to finish the season with an 11–2 record. Johnny Manziel rushed for 229 yards (on just 17 carries) during the game, a Cotton Bowl record and national bowl record for a quarterback, rushing for two touchdowns and throwing for two more. Manziel totaled 516 total yards also a Cotton Bowl Classic record. Though the halftime score was 14–13 Texas A&M, the Aggies went on to score 27 unanswered second half points to win the game. The game's attendance of 87,025 is the second highest in Cotton Bowl Classic history, behind the 2009 game between Mississippi-Texas Tech at 88,175. January 3, 2014: The (9) Missouri Tigers defeated the (13) Oklahoma State Cowboys 41–31 in front of an attendance of 72,690. January 1, 2015: The (7) Michigan State Spartans rallied from a 20-point deficit to defeat the (4) Baylor Bears 42–41 in front of an attendance of 71,464. This was the first Cotton Bowl Classic game to be featured as one of the "New Year's Six" bowls of the College Football Playoff. September 5, 2009: The (20) Brigham Young University Cougars and (3) Oklahoma Sooners played the first college football game in the new stadium, with the Cougars upsetting the Sooners, 14–13, in front of 75,437 spectators. So BYU holds the distinction of being the first college team to win a game in the stadium, and the team to win the first (non-preseason) game in the stadium. September 4, 2010: (6) TCU defeated (24) Oregon State 30–21, before a crowd of 46,138, in a season-opening encounter between ranked teams. September 3, 2011: (4) LSU defeated (3) Oregon 40–27, before a crowd of 87,711 in the third installment of the Cowboys Classic. September 1, 2012: Defending 2011 champion (2) Alabama defeated (8) Michigan 41-14, before a crowd of 90,413 in the fourth installment of the Cowboys Classic. August 31, 2013: (12) LSU defeated (20) TCU 37-27, before a crowd of 80,230 in the fifth installment of the Cowboys Classic. August 30, 2014: Defending 2013 champion (1) Florida State defeated unranked Oklahoma State 37-31, before a crowd of 61,521 in the sixth installment of the Cowboys Classic. The Arkansas Razorbacks vs. Texas A&M Aggies football rivalry, which began in 1903, was renewed in 2009 as the Southwest Classic, and was played at Cowboys Stadium from 2009 through 2011. In 2012, Texas A&M joined Arkansas in the Southeastern Conference, and the series reverted to the schools' home fields, Kyle Field in College Station, Texas for the 2012 game and Donald W. Reynolds Razorback Stadium in Fayetteville, Arkansas in 2013. The Southwest Classic returned to AT&T Stadium in 2014 and will remain there through at least 2020. October 3, 2009: Cowboys owner Jerry Jones watched his alma mater, the Arkansas Razorbacks, defeat the Texas A&M Aggies 47–19 in the first of ten games called the Southwest Classic to be played at the stadium. October 9, 2010: The Arkansas Razorbacks jumped out to an early 21-7 lead, and held on to defeat the Texas A&M Aggies, 24-17. October 1, 2011: The Arkansas Razorbacks rallied from an 18-point halftime deficit to defeat the Texas A&M Aggies 41-38. September 27, 2014: The Texas A&M Aggies rallied from a deficit to force overtime and then scored the only TD for the 35-28 win to defeat the Arkansas Razorbacks. September 26, 2015: Texas A&M rallied from a fourth quarter deficit for the second straight year versus Arkansas, beating the Razorbacks 28-21 in OT. 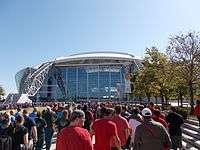 In 2009, the Big 12 Conference game between the Baylor Bears and Texas Tech Red Raiders was held at Cowboys Stadium, the first time in the series the match-up was held on a neutral site. The game was the highest attended in the series' history, with 71,964 in attendance. After the 2010 game was held at the Cotton Bowl in Fair Park, Dallas during the State Fair of Texas, the series will return to Cowboys Stadium for the 2011 and 2012 games. The series' neutral site contract at Cowboys Stadium could continue until 2014. December 19, 2009: In the first college basketball game at the stadium, before a crowd of 38,052, the Texas Longhorns defeated the defending national champion North Carolina Tar Heels, 103–90. July 19, 2009 – Cowboys Stadium hosted two matches in the quarterfinal round of the 2009 CONCACAF Gold Cup. Costa Rica defeated Guadeloupe, 5–1. Mexico shut out Haiti, 4–0 in front of 85,000 fans. July 17, 2010 – On July 17, 2010, two of the top professional soccer clubs in Mexico – Club America and San Luis F.C. – met in a friendly at Cowboys Stadium. Club America made its second appearance at Cowboys Stadium. In 2009, Club America played Chelsea FC in the World Football Challenge in front of 57,229 fans at Cowboys Stadium. June 5, 2011 – Cowboys Stadium hosted the opening matches of the 2011 CONCACAF Gold Cup. Costa Rica defeated Cuba 5–0 in the opener, while Mexico defeated El Salvador 5–0 in the nightcap in front of 80,108 fans. August 6, 2011 – 2011 World Football Challenge; Club America vs FC Barcelona; score 2-0 in front of 60,087 fans. June 3, 2012 - Cowboys Stadium hosted a soccer match in which Mexico played against 5-time world cup champions Brazil. Mexico defeated Brazil 2–0 with goals from Giovani dos Santos and Javier Hernández. July 24, 2013 - Cowboys Stadium hosted the semifinals matches of the 2013 CONCACAF Gold Cup. United States defeated Honduras 3–1 and Panama defeated Mexico 2–1. It was the last event at the venue using the name Cowboys Stadium, and was the first appearance of the U.S. soccer team at this stadium. AT&T Stadium hosted WWE's WrestleMania 32 on April 3, 2016. This marked the third WrestleMania to be hosted in Texas. The area also hosted activities throughout the region for the week-long celebration leading up to WrestleMania itself. WWE broke the attendance record for previous WrestleMania events with an announced, but disputed, attendance of 101,763 people. AT&T Stadium has hosted a round of the AMA Supercross Championship since 2009, replacing Texas Stadium which had been host since 1975. June 6, 2009 – Country music singer George Strait headlined in a summer concert at the opening of Cowboys Stadium along with performances by Reba McEntire, Blake Shelton, and Lee Ann Womack. 60,188 fans were in attendance, with the stadium project not entirely complete. June 20, 2009 – The Jonas Brothers kicked off their 2009 World Tour at the stadium, with Honor Society, Jessie James, Jordin Sparks and Wonder Girls as their opening acts. August 19, 2009 – Paul McCartney concluded his Summer Live '09 Tour at the stadium. This concert was the first official stadium event after the city of Arlington declared the stadium open. September 7, 2009 - The first high school football game played at Cowboy Stadium was between Euless Trinity and Bingham High School (Utah). Trinity won, 42–21. October 12, 2009 – U2 brought their 360° Tour to Cowboys Stadium, with Muse as their opening act. To make room for the large claw-shaped stage, the video board was raised 25 feet (7.6 m) and was not used during the concert. November 12, 2009 – The first Texas high school football playoff game played at Cowboys Stadium was between Bowie High School (Arlington, Texas) and Richland High School (North Richland Hills; Texas). February 2010 – The Professional Bull Riders hosted the Dickies Iron Cowboy Invitational in February 2010. February 2010 – The first MDA Muscle Walk in the Dallas-Fort Worth area took place. This event was held annually, having returned in 2011, 2012, and 2013. That event has since moved to Globe Life Park in Arlington (formerly Rangers Ballpark) starting in 2014. Several participants walk at the 2013 DFW MDA Muscle Walk. February 27, 2010 – The stadium hosted its first Monster Jam event with 11 trucks. This event is now held annually, having returned in 2011 and scheduled for 2012. March 13, 2010 – In a fight billed as "The Event", before a crowd of 50,994, Manny Pacquiao recorded a unanimous decision over Joshua Clottey to retain his WBO welterweight title; Humberto Soto records a unanimous decision over David Diaz to capture the vacant WBC lightweight title. November 13, 2010 – Manny Pacquiao defeated Antonio Margarito in Cowboys Stadium. June 30, 2011 – The final round of the 2011 US Women's Open in bowling was played at Cowboys Stadium, with Leanne Hulsenberg winning. October 8, 2011 – Taylor Swift played a sold-out show to 55,451 people as a part of her Speak Now World Tour. Dec. 7-Dec. 17, 2011 - Cowboys Stadium hosted all the Texas 11-man football state championships for the first time. It was also the first time all 11-man state championships were held in one location. April 28, 2012 - Cowboys Stadium hosted the first opera simulcast in a sports venue in northern Texas when the Dallas Opera's performance of Mozart's The Magic Flute was broadcast to an audience of about 15,000 on the Cowboys Stadium video screen from a closed-circuit feed of the live performance at the Winspear Opera House in Dallas about 25 miles away. February 11, 2013 - American Sniper Chris Kyle's memorial ceremony proceeded by a 200-mile procession across Texas. May 25, 2013 - Taylor Swift played a sold-out show to 53,020 people as a part of the North American leg of her Red Tour. This show marked her second sellout at Cowboys Stadium. April 26, 2014 - AT&T stadium hosted the senior prom of South Garland High School. June 7, 2014 – George Strait performed a show at the stadium to wrap up the "The Cowboy Rides Away Tour". With Jason Aldean, Alan Jackson, Martina McBride, Kenny Chesney (and others) for his "last show ever" (although he has promised to play select dates in the future). Approximately 104,793 fans came to see his last concert while breaking the world record for the largest indoor (U.S?) concert, originally set at a December 5, 1981 Rolling Stones concert before 87,500 fans at the Louisiana Superdome. July 6, 2014 - Semi-pro football (EFL) held its first indoor Pro-bowl game. July 22, 2014 - Beyoncé and Jay-Z played a sold-out show to 41,463 people as part of their co-headlining On the Run Tour. August 24, 2014 - One Direction played a sold-out show to 51,074 people as a part of the North American leg of their Where We Are Tour. March 7, 2015 - The 2015 AT&T American Cup, an FIG World Cup event, is held at the stadium. June 20, 2015 - AT&T Stadium hosted thousands of Spartans for Reebok's Spartan Race. October 17, 2015 - Taylor Swift played a sold-out show to 62,630 people as a part of the North American leg of her 1989 World Tour. This show marked her third sellout at AT&T Stadium. March 6, 2016 - Greg Laurie's Harvest America took place at the stadium. It is considered the largest evangelical event ever. Special guests included Chris Tomlin, Lecrae, MercyMe, and Switchfoot. April 3, 2016 - WrestleMania, the premier event of the professional wrestling organization WWE, was held. May 9, 2016 - Beyoncé played a sold-out show to 42,235 people as part of the North American leg of her Formation World Tour. August 3, 2016 - Guns N' Roses performed at the stadium as part of their Not in This Lifetime... Tour. August 27, 2016 - Coldplay performed at the stadium as part of their A Head Full of Dreams Tour. September 17, 2016 - Saul "Canelo" Álvarez defeated Liam Smith by knockout in round nine, before a crowd of 51,420, to win the WBO light middleweight title. The event broke the AT&T Stadium attendance record for boxing. December 10, 2016 - New Zealand heavyweight boxer Joseph Parker is set to fight Mexican Andy Ruiz for the vacant WBO Heavyweight title. On October 20, 2008, Cowboys owner Jones and New York Yankees owner George Steinbrenner announced a joint business venture called Legends Hospitality Management LLC which would operate the concessions and merchandising sales at the new Cowboys stadium in Arlington, Texas, and at the new Yankee Stadium in the Bronx, New York, along with the stadiums of the Yankees' minor league affiliates. Former Pizza Hut President Michael Rawlings will run the company from its new headquarters in Newark, New Jersey. The company was also backed by Wall Street investment firm Goldman Sachs and Dallas private equity firm CIC Partners LP. The Jones family commissioned 18 contemporary artists to create site-specific artworks for the stadium. The stadium features paintings, sculptures, and installations by Franz Ackerman, Doug Aitken, Ricci Albenda, Mel Bochner, Daniel Buren, Olafur Eliasson, Teresita Fernandez, Wayne Gonzales, Terry Haggerty, Trenton Doyle Hancock, Jacqueline Humphries, Jim Isermann, Annette Lawrence, Dave Muller, Gary Simmons, and Lawrence Weiner. The fees for premium parking at Dallas Cowboys games are estimated at $75 per game, based on season ticket holder parking charges. The fees to park at major concerts and other sporting events will be nearly $40 per space at the new stadium. A shuttle operates between the T&P Station and Cowboys Stadium for all Cowboys regular season and postseason games and selected college football games, which averages approximately 900 riders per game. For special events like Super Bowl XLV parking prices can increase to as much as $990. The stadium is only accessible via the MAX bus system; a 0.4 mi (0.64 km) walk from the Collins and Andrews stop which connects with the TRE rail station. At one time, Arlington was the largest city in the United States with no mass transit system. ↑ "Guest Info". Stadium.dallascowboys.com. Retrieved October 27, 2010. ↑ Schrock, Susan (February 20, 2015). "Arlington blitzing through its stadium debt faster than expected". Fort Worth Star-Telegram. Retrieved March 31, 2016. ↑ "FAQ About Dallas Cowboys Project" (PDF). City of Irving. November 4, 2004. Archived from the original (PDF) on February 6, 2007. Retrieved June 19, 2008. ↑ "Alternative content". Retrieved 10 December 2015. ↑ "Boxing's grand stage". Retrieved 10 December 2015. ↑ "WWE sets all time attendance record". WWE. Retrieved 3 April 2016. ↑ "New Dallas Cowboys Stadium selects SoftTop grass system from Hellas Construction" (PDF). Dallascowboysturf.com. Hellas Construction. Archived from the original (PDF) on March 26, 2009. Retrieved May 22, 2009. ↑ Phillips, Rob (May 27, 2009). "Cowboys Stadium Holds Ribbon Cutting Ceremony". Dallas Cowboys. Archived from the original on July 14, 2009. Retrieved July 5, 2016. ↑ Mosley, Matt (September 15, 2008). "Jones building a legacy with $1.3 billion Cowboys stadium". Retrieved November 28, 2008. ↑ "HKS Architects". Retrieved 10 December 2015. ↑ "404 - Page Not Found" (PDF). Retrieved 10 December 2015. ↑ "What Costs $1.3 Billion, Holds 111,000 people and Has the World's Biggest TV?". twistedsifter.com. September 22, 2009. Retrieved March 30, 2014. ↑ "AT&T Stadium, Dallas Cowboys football stadium - Stadiums of Pro Football". Retrieved 10 December 2015. 1 2 "World Stadiums - Stadiums in the United States :: Texas". Retrieved 10 December 2015. 1 2 "NFL regular-season-record crowd of 105,121 sees Giants-Cowboys". nfl.com. September 21, 2009. Retrieved April 19, 2015. ↑ "Dallas Cowboys Target NFL Record by Making Fans Stand for $29". Bloomberg.com. August 3, 2009. Retrieved July 5, 2010. ↑ "Cowboys' new stadium to get over 20,000 square feet of video screen". Engadget. Retrieved February 6, 2011. 1 2 "Cowboys Stadium". Football.ballparks.com. Retrieved February 6, 2011. ↑ "Local Government Services Database Search". Retrieved 2012-10-19. ↑ "Cowboys unveil plans for new stadium". ESPN.com. December 13, 2006. Retrieved January 15, 2008. ↑ "Dallas Cowboys New Stadium Chock Full Of Sony HD". Sony Insider. April 20, 2009. Retrieved February 6, 2011. 1 2 Chase, Chris (September 28, 2009). "Guinness World Records to Recognize Dallas Cowboys and Mitsubishi Electric Diamond Vision for World's Largest Video Display". finance.yahoo.com. Retrieved October 8, 2009. ↑ ABC News. "Sports News". ABC News. Retrieved 10 December 2015. ↑ "Stadium Systems & Technology : Vahle Electrification". Vahleinc.com. Retrieved May 28, 2012. ↑ "Snapshot: Key contracts awarded for Dallas Cowboys stadium". Dallas Business Journal. March 6, 2009. Retrieved April 16, 2009. ↑ Dallas Morning News: Arlington turning to eminent domain for stadium land. ↑ "Demolition Started for Cowboys Stadium". Associated Construction Publications. Archived from the original on May 29, 2009. ↑ "Alliance Announced". Associated Construction Publications. Archived from the original on May 29, 2009. ↑ "All Up From Here". Associated Construction Publications. Archived from the original on May 29, 2009. ↑ "Construction Worker Remains Hospitalized". The Dallas Morning News. Archived from the original on January 25, 2010. ↑ "Heldenfels Awarded Contract". Associated Construction Publications. Archived from the original on May 29, 2009. ↑ "Dallas Slideshows – Cowboys Unveil World's Largest HDTV". Village Voice Media. 1 2 3 "New Dallas Cowboys stadium to be called Cowboys Stadium". ESPN. May 13, 2009. Retrieved May 13, 2009. ↑ "George Strait to Headline Debut of Cowboys Stadium". CBS 11 News/AP. February 17, 2009. Archived from the original on February 22, 2009. Retrieved February 23, 2009. ↑ "CONCACAF Gold Cup Attendance Down Slightly From '07". SportsBusiness Daily. July 28, 2009. Retrieved October 19, 2012. ↑ Archer, Todd (August 20, 2009). "Dean Named PA Announcer for Cowboys Stadium". The Dallas Morning News. Archived from the original on October 28, 2009. Retrieved August 20, 2009. ↑ "Titans to Host Bucs, Packers in Preseason". The City Paper. Nashville. March 31, 2009. Retrieved May 25, 2009. ↑ "NFL releases full regular-season schedule". yahoo.com. April 14, 2009. Archived from the original on October 19, 2011. ↑ "A Sign of Conquest, Eli Manning's Signature, Remains at Cowboys Stadium". The Dallas Morning News. October 25, 2010. Retrieved May 27, 2012. ↑ "Cowboys shut down Panthers", ESPN.com, September 28, 2009. Retrieved on September 28, 2009. ↑ "Cowboys Hope New Home Brings NorCal Fans News10.net | Sacramento, California | Sports News". News10.net. June 21, 2009. Retrieved February 6, 2011. ↑ Kreindler, Eric, Hoops Heaven at JerryWorld: Crews prepare for Texas basketball game, December 16, 2009. Retrieved January 10, 2010. ↑ Drape, Joe (January 29, 2011). "For N.F.L., Lockout Would Be a Risky Strategy". The New York Times. ↑ "Costas reference to "the palace in Dallas" irks Arlington mayor". Cowboys Stadium Blog. Stadiumblog.dallasnews.com. September 22, 2009. Retrieved May 28, 2012. ↑ Popik, Barry (August 7, 2009). "The Big Apple: Cowboys Cathedral or Cathedral of Football (Dallas Cowboys Stadium in Arlington)". Barrypopik.com. Retrieved May 28, 2012. ↑ Mosley, Matt (May 22, 2007). "Indy, Arizona had no chance". ESPN.com. Retrieved January 15, 2008. ↑ "Cowboys Stadium now called AT&T Stadium after deal". NFL.com. July 25, 2013. Retrieved July 25, 2013. ↑ Staff reports (July 25, 2013). "Report: AT&T naming rights for Dallas Cowboys' stadium $17-19M a year". Dallas Morning News. Retrieved July 26, 2013. ↑ Nagy, Monica (3 March 2014). "Crews finish mounting massive 'AT&T' letters on Cowboys' stadium". Fort Worth Star-Telegram. Retrieved 22 June 2014. ↑ Chase, Chris (August 22, 2009). "Punt hits video screen at new Cowboys Stadium – Shutdown Corner – NFL – Yahoo! Sports". Sports.yahoo.com. Retrieved August 26, 2009. ↑ Archer, Todd (August 25, 2009). "The Cowboys Stadium digital board is a hot topic". The Dallas Morning News. Archived from the original on January 15, 2010. ↑ "Pre Wk 3 Can't-Miss Play: Cincinnati Bengals receiver Brandon Tate returns re-punt for touchdown". NFL.com. Retrieved 10 December 2015. ↑ "2010 All-Star Game recap". National Basketball Association. 2011-12-05. Retrieved 2012-11-03. ↑ "Dallas Cowboys Schedule at". Nfl.com. Retrieved February 6, 2011. ↑ Spagnola, Mickey (May 22, 2007). "At Long Last, Super Bowl Coming To North Texas". DallasCowboys.com. Archived from the original on December 30, 2007. Retrieved January 15, 2008. ↑ Williams, Charean (January 29, 2012). "Super Bowl Bound to Return, But When?". Fort Worth Star-Telegram. Retrieved May 21, 2012. ↑ Sickles, Jason. Fans denied access to seats for Super Bowl. Yahoo! Sports, 2011-02-06. ↑ "Super Bowl Seating Lawsuit: Why Jerry Jones Must Pay the Displaced Fans". February 9, 2011. Retrieved February 9, 2011. ↑ "Big 12 Conference Concludes Spring Meetings; Future Championship Sites Approved For Football, Basketball". Big12sports.com: The Big 12 Conference Official Athletic Site. May 24, 2007. Retrieved June 21, 2010. ↑ Tramel, Berry (December 13, 2014). "Big 12 football: Why a conference championship game is the easiest fix for Big 12's woes". The Oklahoman. Retrieved January 6, 2015. ↑ "Oklahoma State Official Athletic Site – Football". Okstate.com. January 2, 2010. Retrieved February 6, 2011. ↑ "NFL releases full regular-season schedule – NFL – Yahoo! Sports". Sports.yahoo.com. April 26, 2009. Archived from the original on May 5, 2009. Retrieved May 5, 2009. ↑ "Oregon State vs TCU Stats". Retrieved 10 December 2015. ↑ ESPN.com, October 3, 2009. Retrieved on October 3, 2009. ↑ ESPN.com, October 9, 2010. ↑ "Baylor, Texas Tech to play football in Cowboys Stadium in 2011 | Texas Tech Red Raiders News - Sports News for Dallas, Texas - SportsDayDFW". The Dallas Morning News. February 23, 2011. Retrieved May 28, 2012. ↑ "Official website of University of Texas Athletics – Texas Longhorns – Men's Basketball". TexasSports.com. Retrieved February 6, 2011. 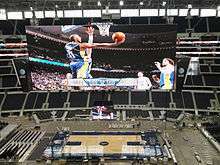 ↑ "South regional at Cowboys Stadium features a giant TV screen — and, oh yeah, a basketball court". Yahoo Sports. 28 March 2013. Retrieved 10 December 2015. ↑ "Events". Stadium.dallascowboys.com. Retrieved February 6, 2011. ↑ "AT&T Stadium to host WrestleMania 32". ↑ "Four high school playoff games scheduled for Cowboys Stadium". Cowboys Stadium Blog. Retrieved 10 December 2015. ↑ "PBR – Professional Bull Riders Invades the Brand-New Cowboys Stadium in 2010". Pbrnow.com. Archived from the original on December 28, 2010. Retrieved February 6, 2011. ↑ "Boxing: Home". HBO. January 29, 2011. Retrieved February 6, 2011. ↑ "Leanne Hulsenberg triumphs in the 2011 Bowling's U.S. Women's Open". Bowlingdigital.com. Retrieved July 3, 2011. ↑ "Dallas Opera simulcast at Cowboy Stadium". Retrieved February 19, 2012. ↑ Coppinger, Mike. "Canelo Alvarez knocks out Liam Smith with punishing body shot". USA Today. USA Today. Retrieved 18 September 2016. ↑ Dallas Cowboys, New York Yankees form joint concessions venture (The Dallas Morning News) Archived June 11, 2009, at the Wayback Machine. ↑ Cowboys, Yankees form company for new stadiums (Associated Press) Archived October 29, 2008, at the Wayback Machine. ↑ "Art Commissions". Retrieved 10 December 2015. ↑ Dickson, Gordon (April 2, 2009). "Dallas Cowboys, Texas Rangers Reach Deal on Parking Spots". Fort Worth Star-Telegram. Archived from the original on April 2, 2009. ↑ Kennedy, Bud (June 4, 2009). "KENNEDY: $40 for Cowboys Stadium Parking? Sure Would Be Nice to Have Mass Transit...". Fort Worth Star-Telegram. 1 2 "Special Programs". The T. January 7, 2011. Retrieved February 6, 2011. ↑ Weir, Tom (January 26, 2011). "$990 for a parking spot at the Super Bowl". USA Today. Game On! (blog). Retrieved December 9, 2011. 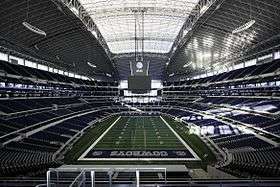 Wikimedia Commons has media related to Cowboys Stadium. There was a Cotton Bowl Classic in January and December in 1966 and 2015. There was no Cotton Bowl Classic in 1967. The game was a College Football Playoff semifinal in its December 2015 edition.